As usual, without much botheration on where, who, how, etc, I set out from my home town in a bus that was an overnight journey to reach Mangalore. On reaching, Arjun came to pick me up and dropped me at Vishwanath Uncle's place where I freshened up, had breakfast and within 30 minutes we were on our way to the Railway station to catch the 9:15 am train to Kanhangad. It was a delight to meet all of them at the station and we spoke to each other in the train till we reached Kanhangad station at 10:40 am. From there it was a 10-minutes auto ride to the ashram. Uncle had already booked 4 rooms and we quickly did unwind ourselves. I was happy to see that I got the same room No.4 that we had been in last time. By 11:30 a.m. we went into the caves. The caves here have a special quality; in the cold season it is warm inside and in the warm season it is cold inside - the pattern based on "shanmugatatva". This time it was better as there was no much of group activities and everyone did whatever they felt like doing there individually, like - meditating in the caves, in the above Nityananda samadhi mandir, attending pujas &amp; homams, or just simply sitting above the caves or in Swami Jnanada temple below. Trust me, freelancing stuff is always better :) Anything and everything one did here brought only one thing - peace with inner smiles. As a rule here, one has to attend all ashram activities and food on time and that is what the people here are particular about. The watchman uncle is a humble soul who is seen moving everywhere in the ashram and taking care of everything there, keeping watch on all activities. I have seen him to be in glory when he talks anything about Baba but at the same time have seen him shouting if anyone does anything that goes against the normalcy there. Last time, I had got firings from him for not taking my slippers off as I had ran up to the top of the cave with slippers on. It was a good firing but same evening he was happily sharing his experiences with Baba when he was a kid. This visit he was yelling at some lovers loitering around to find their own solace of romance ignoring the unconditional peace and bliss that physical company could never give. The first day we spent in the ashram and evening we all went to Guruvan since some of them had to leave the next day as their planned trip was short. Evening, when we reached Guruvan (more details of all these places are in my previous article) we all met Swami Vidyananda who stayed there all alone and supervised and looked after that place. There is a construction of Nityananda Baba's temple going on in Guruvan, which you can see on the left. In the backdrop where there is a blue poster is where the holy cave is, in which Bade Baba did tapas. I have elaborated about this in previous article. The moment I saw Guruvan this time, I was taken away with the beauty of it because last time we came here it was raining heavily and we could not stay for more time. This time we could see everything clear and enjoy the visual treat of tall trees all around with the sound of wild birds and the sound of gushing water. I immediately missed my camera, which I could not bring as it's lens failed. I constantly told Arjun how I wish my camera was here. (How these pictures came up here is revealed further.) Soon we gathered in a room kindly given to us by Swami Vidyananda and we all sat down to meditate. We sang a few of songs before sitting there in contemplation. After about close to an hour I got up and came out while the others continued meditating. As I came out I saw Jagdeesh standing there. We had met Jagdeesh during our last time and his mother had booked the ashram rooms for us and was known to one of the seekers with us. We started talking to each other and by then everyone finished their meditation and came out. It is difficult to get buses from Guruvan to go back. The ladies walked down the hill and soon called us to let us know that they have got an auto back to the ashram. Jagdeesh told us surprisingly that he has brought his Maruti Omni and insisted that he would drop us. As we were getting into the car, Jagdeesh also told me that he would get his digital camera the next day to shoot the hill and I was awed. In the car I was telling Arjun that there is nothing impossible even in the remotest place for Baba takes care of everything. I told him that not only the camera but also the timely drop without waiting anywhere that we all got back to the ashram was Baba's love. The entire trip and every moment Baba took care of us including delaying trains and buses whenever we got late reaching the station or bus stand. Nowhere we had to wait or face any kind or difficulty during the entire trip to such a remote place. Some things in this article may sound too exaggerating but you would only benefit to know that it is not :) We planned that we would come here next day and stay one entire day and night in Guruvan. After returning back to ashram, I and Arjun chose to just sit above the cave at my favorite spot in front of Baba's temple overlooking the vast water filled with white lotuses and from where one could see the trains passing by. 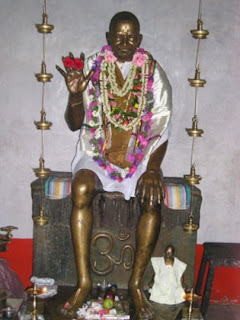 In this temple sits Baba's huge statue made of panch-loha in the abhaya mudra. I do not know but every time I sit here I get a strange mixed feeling of being emotional and also peace and bliss. Seekers can easily feel the energy here and more intensified when you give shambhavi to Baba's statue. We both sat and chatted there for a while. The lunch time was over we could see people washing their plates down below. Ganapathiji who looked after the Bhandara service spotted us sitting up while he was washing his plate and asked us to have food. We were full as we had had some snacks while coming back to the ashram from Guruvan and we told him that we were not having lunch. He quietly went away. Then I realized that the kitchen prepares food according to the number of people present there and it would not be fair on our part to do this. I and Arjun immediately went down and asked Ganapathiji if it was okay we did not have food since we were feeling full. He said, "It is okay but we will ask of you only two things - to be present for all activities in the ashram and to be present all time for timely food." I said we would take care of that and thanked him for his smilingly meaningful reply. Last time I came here I used to see this person (Ganapathiji) in a very serious look serving food and doing seva in the ashram. This is the first time I ever saw him talking so many words. He later stopped me while passing by in the evening and asked for my contact number to which I told him I will give him written on paper. I wondered why. After some more moments of communication with Bade Baba in the vicinity of the ashram, we got into our rooms. I dropped on the bed and was fast asleep and woke up at 6 a.m. next morning. After freshening up, we began with the normal activities of attending the aartis and meditation in caves and elsewhere. Mallya aunty was requested to sing a few songs which she did without any hesitation. She has a very beautiful voice as though that of a trained singer and it reflected immense devotion. Soon, it was time for us all to depart as per their plans. The families were supposed to stay back in the ashram and leave in the evening to their homes while we were to leave now to Guruvan after lunch and stay the night there and return the next morning. We soon bid each other goodbye and me, Arjun, Vishwanath Uncle and Gangadhar uncle left for guruvan packed with fruits that would be our dinner in that forest. On reaching there, I was happy to see that as promised Jagdeesh had come with his camera and gave it to me. He had also brought along with him his father who was 85 years old but never showed any signs of any kind of weakness. 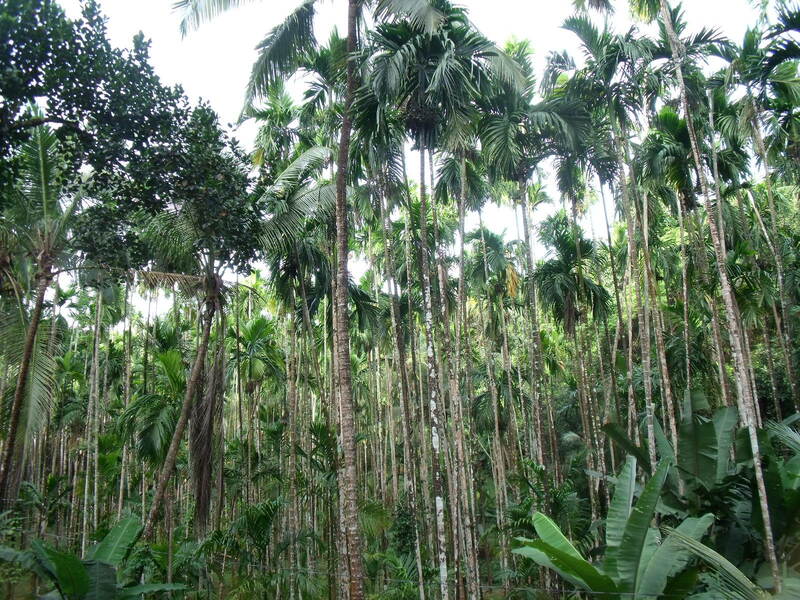 He was a vaidya (ayurveda doctor) who had knowledge of all kinds of herbs in the forests. 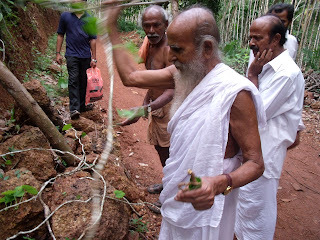 He was a person from siddhashram (the same place from where Mohan Swami was, whom I have written earlier in this blog. 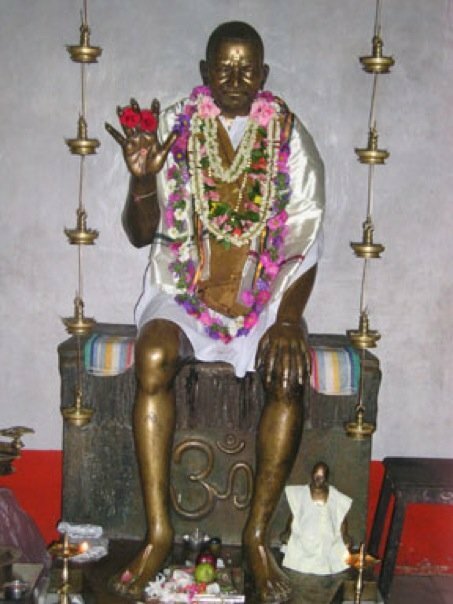 Click here to read) These swamis belonged to the Siddha Samaj whose founder was Swami Sivananda Paramahamsa in Kerala who was at the time of Bade Baba. 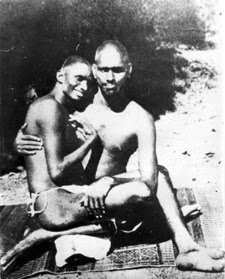 There is a famous photograph of Baba Nityananda sitting on the lap of Swami Shivananda. I now got to know that this is the same ashram from where Swami Mohan has "graduated" from and was awed to know how everything was strangely yet beautifully connected, for I meet Swami Mohan frequently who stays about only an hour from where I stay. He had told me to visit Siddhashram whenever possible in Vadagara, Kerala and to let know if I had any problem visiting inside the ashram. Now, it struck to me that it is the ashram of Swami Shivananda Paramahamsa who was a great yogi who taught pranayama. His deeksha included various kinds of pranayama and if mastered one could attain nirvana. So, Jagdeesh's 85-year-old father was also a person linked with Siddhashram. I spoke to him in Malayalam affectionately calling him "Acha" meaning father and he shared some of his episodes with Baba Nityananda when he was a small child. He remembered Baba giving him bananas everyday as he went from school to where Baba was constructing the caves. Jagdeesh then told us that we could go atop the hill of Guruvan and see the sunset. It was a good idea for MritSanjeevani too and we all walked with him and his father who was leading us. On the way up, he stopped to pick herbs and medicinal plants that included roots (which he said was an antidote to any kind of poison. This man had all signs of a yogi, was calm, poised, talked very less, very active to everything around him. The way up was not very hard or long and we reached the top in about 15 minutes. It was a magnificent view from the top. It was nearing sunset and we all sat facing the sun and did MritSanjeevani sadhana as the sun was setting. After that, we asked Swamiji to sing songs and he readily sang out a Kannda and a Malayalam song sitting in the yogic posture seemingly with complete command over his breath. We then made our way down the hill and our way down Swamiji was silently listening to my conversation with his son, Jagdeesh, who was sharing how every mythological event was a symbolic expression that contained more than the drama of the story and characters that people stick on with. Everything, he said, including the Mahabharata and Ramayana were illustrated with great meanings containing the secrets of evolution but how everything remains hidden and people got serious only with the characters and stories and places. In one instance he mentioned to me about Ramayana where Rama is the soul and Sita is nothing but the breath that gets caught by the 10-headed Ravana symbolizing the 10 indriyas (senses) and Rama fights back this from the clutches of the senses and brings back Sita (breath) under control. 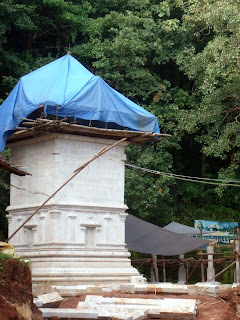 He also mentioned that the 18 holy steps that pilgrims cross at Ayyappa Shrine is nothing but the symbolic representation of indriyas and bhavas (I made a check on this and found that the first three steps depict “Bhoomi, Agni, Vayoo &amp; Akash”, 6 to 9 steps for Karmendriya, 10 to 15 for Jhanandriya, 16th for mind 17th Intelligence and 18th Jeevathma Bhava.) Climbing over each step represents the victory over these indriyas and thus enlightenment but rarely is the actual pilgrimage undertaken with these insights. All these were quite an eye-opener for me and a great learning which I wished to share here. Soon, he drove away with his father along with the camera so that he could give the images and videos the next day which was our last day at the ashram. This visit with Swamiji was again surprising because though he stayed very close to Guruvan, he was coming to Guruvan there after 6 years and he came to meet us! We were blessed to spend some time with him. We came back to the room that was besides where the young Swami Vidyananda stayed in the forest. I missed taking his snap for by now the camera was gone with Jagdeesh. In the veranda of the small house, we sat talking with the young swami. I asked him how was he living there all alone and about fear. He said he was there since he was 9 years old and hailed from Hubli. He had distanced himself away from his physical family almost at a very young age, when he joined Siddashram at the age of 6 and at the age of 9 he was in Guruvan. He was now 44 but looked just 26-28!! He said there was nothing to fear when Baba was always there. It is inspiring to see him move around hurriedly in that place barefooted, waking up at 4 a.m. and doing abhishekham for the idol of Baba in the temple there and offering flowers to the local deity and the eight stone lingas, and this he did throughout all seasons of the year. He even said that he stepped on naag snakes in the dark five times but never did one bite him. He says snakes even move on the roof of his room in search rats and sometimes fall down in the room while chasing these rats. After a little talks with him, he retired at exactly 9:30 pm which he said was his sleeping time. We then sat for sometime in meditation and then were sitting out in the verandah of the rooms. I was very keen to go and meditate near the caves but uncle simply wouldn't allow. A little disturbed, I sat out of the house with my iPod listening to the blissful music in the enchanting environment of a cool jungle night. 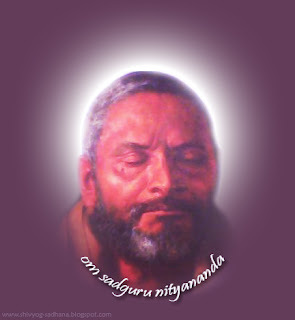 We all tossed to sleep at around 11 p.m.
Next morning woke up at around 7 a.m. and ran to the Nityananda temple to to bow to him where Swami Vidyanand was doing aarti. After the aarti he turned around and asked me with a smile in Malayalam, "Have you had bath?" I smiled sheepishly and ran away from there straight to have a bath in Paapanashini Ganga. This water is very clear and full of prana. When Bade Baba came here for penance, there was no water around and thus he struck a rock from where water sprouted and he gave it's name. I drank lots of it and this is the only place I have drunk water apart from boiled and cooled water from home or mineral water. You never feel the need to worry here about anything in any manner :) After the bath, since I was desperate to meditate near the cave, I attended the aarti at the temple and ran up to sit near the caves where I finally felt contended and meditated there for some time. After meditation, I was honored to have black tea that was lovingly prepared and offered by Swamiji. Thanking him for everything, we left from there at 8:30 a.m. since I had some homams scheduled at 9 a.m. back in the ashram. Just five minutes to 9 a.m. we reached the ashram room and within minutes I was up at the Nitayananda temple for the homam. After that it was a quick breakfast and we talked with each other for sometime and spend time packing since we had to leave the same evening by the 3:50 pm train to Mangalore. I was just not in the slightest mood to leave and dragged myself around with the pinch of leaving. Before leaving for Kanhangad, I had written to Gopalkrishna Shenoyji, as last time, if I need to meet any other person there during this visit to which he had replied that meeting only three souls were enough - Bade Baba, Swami Jnananda, and Padiyar Swami (in samadhi). I obviously knew about Bade baba and Swami Jnananda (Bade Baba's disciple who was assigned by Baba to look after the Kanhangad ashram) but never had seen anything about Padiyar Swami there. I had asked this to the watchman uncle there about Padiyar swami and he told me that it was out of the ashram and needed to go about a kilometer from there. For the first two days I had this desire to go there but never found time and the this day, that is the third day, I had completely forgotten about it. We had lunch and sat in the temple for a while. This day I had not gone into the caves and thought I should and brought my asana but somehow got involved in talking to the group. It was 1 p.m. and then something strange happened. Ganapathiji (who I mentioned earlier did seva in the kitchen) walked up to me and said, "Come, let's go." I jumped up from my seat and did not want to question him anything. I remembered that he had asked my contact number and said I will give it to him. He said, "That is okay, but now we will go to one place" It looked like he did not want to tell where we were going. I got a little inquisitive and replied, "Sure, but where?" Looking at my inner doubt he replied, "Kushal Nagar" I was dumb-folded and awestruck and suddenly remembered that I had forgotten about visiting Padiyar Swami and Kushal Nagar is where his samadhi is!! Not thinking any further I was overjoyed and ran to the room to put on my footwear and we all walked along with him. I did not question him anything but was delighted all the way that I was going where I was supposed to go. I knew for sure that this was the reason I got entangled in that discussion and could not go into the caves. If I would, I would have have missed Ganapathiji and then we would later left the ashram without going to Padiyar Swami! 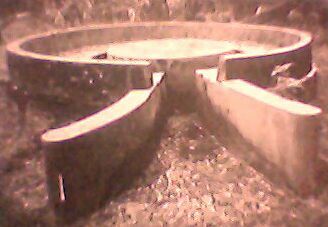 On the way Ganapathiji showed us the round table of stone built by Bade Baba in 1931 and called it the ''Round Table Conference." He would sit at his table and speak of various world issues, relating first the views of other world leaders and then those of Gandhi. Now, at this very time there happened to be an international conference taking place in London. Skeptics amoung the Master's listeners who checked the newspaper accounts of the ''real'' Round Table Conference were amazed to find that they coincided exactly with Nityananda's words. After sitting here on the round table for a while, we moved a few steps from here and we were in the compound of Padiyar Swami's house and we first visited his samadhi which was in the vicinity of the compound itself. Then we walked into the house and it was then I realized that Ganapathiji lived here! He was taking care of this house. I cannot mention in words the peace and tranquility one can instantly sense the moment one steps in. The vibrations are high here. 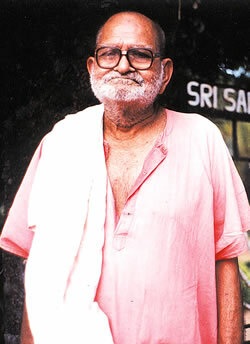 Padiyar Swami met Bade Baba when he was 14 years old and stayed for many years with Baba in Ganeshpuri serving him. Once Swami Muktananda approached Baba requesting that Padiyar Swami be initiated into sanyas to which Baba replied, "Where is the need for a born sanyasi to be initiated?" Just before Baba's mahasamadhi, he instructed Padiyar Swami to live in this house saying "Everything will come to you, no need for pranayama, meditation, asanas, or anything of the kind. Do only SUVICHAR (good thoughts) and stay there doing little service to the people." Padiyar Swami stayed here since then in obedience to his Guru's order and everything happened as Baba promised him. Padiyar Swami always mentioned the words of Bade Baba and these words were printed on many of Swami's photos in the house "You must not leave the feet of a guru. Your mind should not flicker like the reflection of the sun in the shaking water." Ganapathiji said that we could go in whichever room we pleased and sit wherever we wanted. The first room had the chair of Padiyar swamiji and photos of Nityananda baba everwhere. To the left was a room which was used by Ganapathiji that connected to the kitchen. The central room had a sofa and chairs and had a huge table that displayed many photographs and idols of Nitananda Baba. This was the room I preferred sitting and meditating and it was such a beautiful communication here! This room led to two other rooms, the bedroom which was divinely magnificent of Swamiji's energies. It contained a bed, clock, 4-5 walking canes, and the other things that he regularly used. The other room was the pooja room filled with Nityananda Baba's photos and idols and every photo of his carried a Ganesh photo or idol. On the wall hung a photo of a yogi from Kashi who looked to be in his 50's. Ganapathiji told us that he lives without eating or drinking and that Bade Baba had told he would remain for 124 years! One of us tried to close a wide open window to which Ganapathiji said that there was no need to close it. When told that snakes could come in he said, "They come and go, it is no problem. Let it remain open." He then showed us through the window about a few feet ahead a huge snake burrow. We spoke for sometime sitting on the floor of the entrance room. We were highly honored when Ganapathiji made us tea and served us. It felt as though we were invited by Padiyar Swami there and was treating us like a guest. It was 3 p.m. when we took leave of him. While leaving Ganapathiji gave us some apples that was on Swamiji's chair and had been offered by some visitor. When we refused, he said, "Swamiji never kept anything, he gave to others what was offered to him". While exiting the beautiful home, when I was alone with Ganapathiji, I asked him why did he approach me and invite me here? He just smiled. On repeated questioned he repeatedly smiled. Seeing no answer from him I told him that it was my desire to come here since I reached Kanhangad and had forgotten completely about it when he came and asked me. He replied, "Anyone who desires for him (Padiyar Swami) will come here. He is very powerful and still lives here." 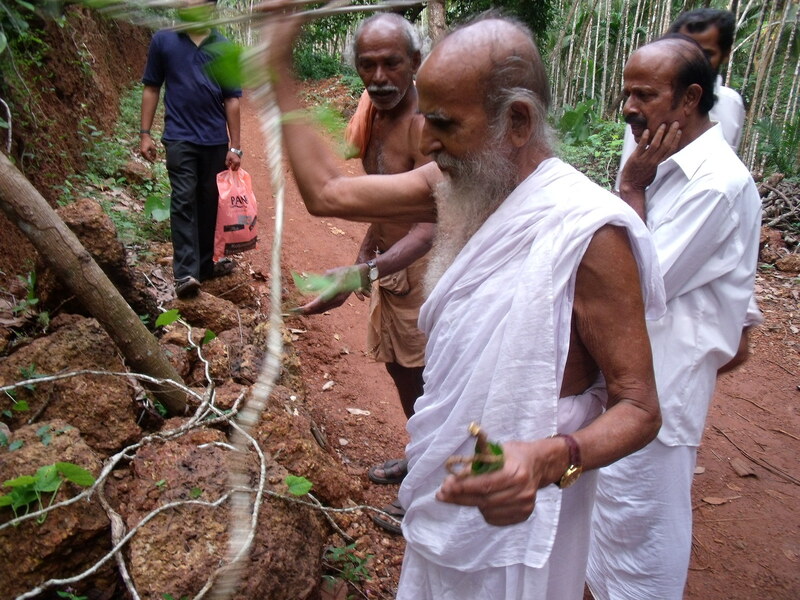 He then continued, "I'll introduce you to a person Murli in Belgaum (where I stay) and he will take you to a place." When I asked him which place he only smiled. Not wanting to allow any logic into all this, I thanked him profusely for everything and we left from there back to ashram. Our train was at 3:50 p.m. but I did not have the slightest wish to leave. I was thinking it would be better if we would have gone by the 5:30 train. As soon as we reached the room, Arjun told me that he wished if we would leave by the 5:30 train and I was delighted. We both sipping our tea in the Bhandara asked both uncles that they could leave and we would be coming by next train. They refused and said they would also wait and come with us. I wanted to spend some more time with Baba. But I soon realized that Baba made me wait because I had forgotten another thing. The pictures of Guruvan and videos were in Jagdeesh's camera and he was supposed to give it today. As I took my asana and was walking towards the caves Jagdeesh brought me the CD of the images. I would have missed this if I had gone by the 3:50 train. Thanking him I went into the caves and meditated there for a while. From there I went above and sat there also for a while. 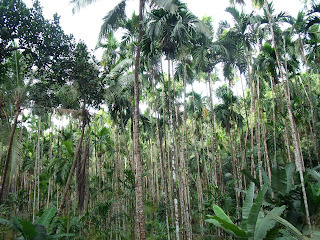 By this time it was 5 p.m. and we all left the ashram bidding goodbye to the wonderful people there. There was no auto available and we had to walk for some distance. By the time we took an auto it was already 5:30 p.m. and we did not want to miss this train. When we reached the station there was a long queue and we had a doubt whether it would be possible to get this train. But as it had to happen, the train was 20 minutes late and we comfortably got out tickets and boarded the train. In one hour we were back in Mangalore. It was 7 p.m. and like last time, I was confident that I would get a ticket back home. I booked the 8 p.m. bus and Uncle Vishwanath insistingly took me to his home inspite of telling him that there is only 40 mins for my bus to come. There he and aunty who lovingly prepared for me, made me eat supper along with a cup of oats. I looked at the watch. It was only 5 mins to 8 p.m. and I was still eating! I said to Baba that uncle wont understand and does not listen at all and I got a reply. "Eat and relish it with no hurry." I relaxed immediately and finished the plate. By the time we left it was 8 p.m. and Uncle drove me for a while in his car through the traffic and signals. Again, we reached late but the bus also came late. It came after we had the time to speak for a few minutes there. Soon I was into my seat moving out of Mangalore. I reached home next morning 8 a.m.
Thanking all my friends in this visit and Gopalkrishna Shenoyji for his guidance and all people we met during this short but beautiful stay and travel. Thank you for joining in this virtual trip :) My intention here was to share the entire travel that will convey a lot of messages and learning in some way or the other for I have known that this is the way Baba works. If possible do go there once and meditate and connect to all divine beings there.